Can I be really honest with you guys? I was a little intimidated to meet Karen Gillan while visiting the set of Guardians of the Galaxy 2 last year. She is such a bad a** on screen, right? But when it came to our official sit down, she was nothing but kind and genuine. Sweet as can be and the complete opposite of Nebula. Honestly, I don’t know what I was expecting. Her to walk into the room, slam her hand down on the desk and demand questions? I’m insane!! I guess that goes to show you how obsessed I am with her role. Our interview surrounded Karen’s makeup routine and her relationship with some of the other cast members. We also tried to get some script secrets out of her… but she was pretty tight-lipped. How has Gamora’s and Nebula’s relationship changed in this movie? I think we’re just going to really delve much further into it and we’re going to learn about their back story as well which is really exciting for me as an actress to kind of explore. We’re going to learn that they have very severe daddy issues. When Thanos is your father… of course you’re going to have those. Usually, they communicate quite physically. Like it’s sort of you know, sisters pull each other’s hair. They sort of try to kill each other. What is it like to be back with the cast? It’s so nice to be back. It’s such a line to say, “we’re like one big happy family.” But we genuinely are! Yeah, it’s great. Everyone’s really nice and it’s just so much fun to be on this set and they play music and it such a joyous experience. 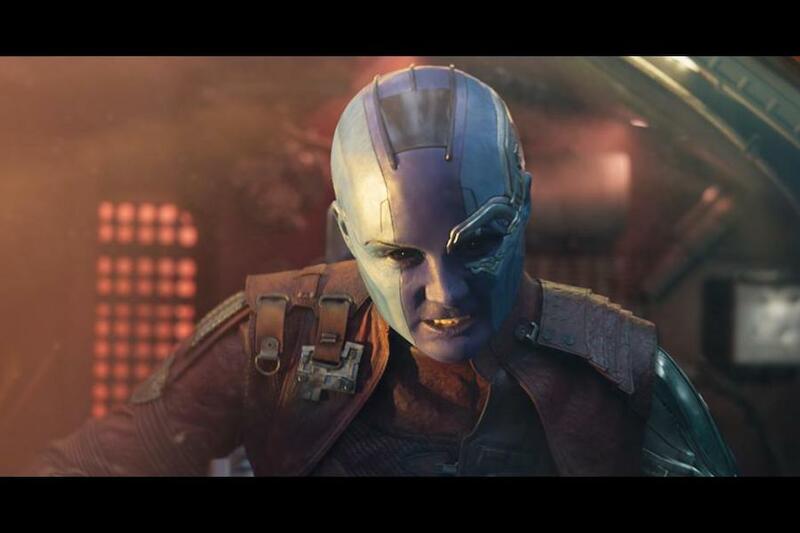 What’s the makeup process like for Nebula? I mean elements are comfortable. It’s not what I would choose to wear lounging around the house. I mean this is not very comfortable but it looks so cool so it’s worth it. We have a bit of a different look going on in this film, so she gets a costume change which is very exciting. I do love the purple though, the original. I’ve been able to keep half of my hair for this film, which is very exciting. So that added an hour of just wrapping all the hair up in a bald cap. And then it takes about 2 1/2 hours to put the makeup on, which is actually quicker than the last film. The last film was maybe around five hours for the full process. Then, to get into this outfit is about 20 minutes. So I mean it’s quite a long process but it’s just so worth it. Sort of does half of the job for you as an actor because you look like this. What do you do to prepare for such a physical role? Well, I work out with the Marvel stunt team and that is so ridiculous. Oh my God, like I come out and I have to take a nap. It is like with all the stunt guys and they’re like jacked. So yeah, I do that as much as I can. Here she is at Comic Con without all the makeup and all of here hair! Are we going to see a softer side of your character? Maybe, yes, maybe. I think so. I think we’re going to understand her more. We’re going to have a bit of empathy towards her. As to whether that makes her soft I don’t know because she’s you know, she’s still classic pissed off Nebula. We’re just going to understand why she does the things she does and understand her relationship with Gamorah in much more detail and maybe understand that Gamorah wasn’t as nice as she makes out towards Nebula in their childhood. What did you find was challenging for Volume 2 versus Volume 1? I guess probably just delving further into the history of the character and I am finding that balance between playing an evil villain people love to sort of hate but trying to tell the truth and not make her likable because that’s not what I’m setting out to do… but to just serve the role in the right way. 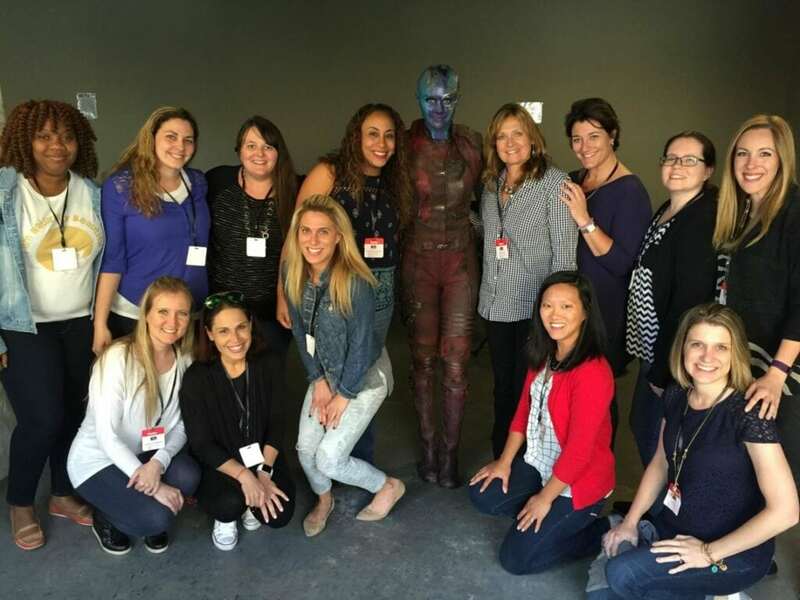 Can you tell us about Nebula’s new hand? Ooh, the mystery of the hand. I don’t want to give away anything. She’s definitely got something in place of the hand that she chopped off, not necessarily a hand. So she goes on a mission to rectify this. So it’s a whole thing. She’s on the hunt to replace whatever is there. And then she does replace it with something really, really cool. Oh yeah, did you see this new spot that aired during yesterday’s Big Game??? I just can’t wait to see this in the theater with my kids!!! Guardians of the Galaxy 2 hits theatres on May 5th. Will you be there to learn more about this unraveling story?! *Disney invited me to the set of Guardians of the Galaxy 2 to interview the cast. All opinions are my own.